One of the greatest challenges facing any couple planning their wedding is what style to choose. In all my years of Hudson Valley wedding photography I have been consulted on the matter by countless couples. Figuring out the theme and style of your wedding can cause a supreme headache and leave you wanting nothing to do with your own wedding. Despite the fact that it can be quite the challenge, it can also be quite easy to come up with the perfect theme for your wedding. A lot of it ties in with the location you choose, in which case Hudson Valley has plenty of great spots. However, most of it is really just about following your heart. You need to dream first then make that dream a reality and worry about the budget only when you have an idea of what you want. Most people commit the mistake of worrying about the budget first. When that happens, a lot of good ideas get aborted early. When you have a clear theme idea for your wedding, you’ll find it much easier to get the right location, the right mix of colors, and also the right photographer who is capable of capturing the essence of the wedding in every photo. What’s more, in a few easy steps, you can come to a decision on what you want the theme of your wedding to be. Every great thing that has ever been created started in the mind. You need to recognise your dreams for what they really are: a crucible for beautiful ideas to take form. As you set out, take some time with your significant other to let your imaginations run wild. What do you see when you picture your dream wedding? Is it a big wedding that everyone and their mother attend? Is it a small gathering for close family and friends? Is it going to be outdoors or indoors? Do you plan on having a wedding in your home town or would you prefer a destination wedding at your dream holiday destination? Will the wedding be fancy or casual? What season will it be in? What vibe would you like it to have? Classic, rustic, modern, or romantic? These and many more questions should help guide your mind and point it in the right direction as you envision the perfect wedding. As you come with ideas, you shouldn’t overlook other sources. Magazines, blogs, and photos of real life weddings should give you plenty of inspiration for what you would like to include in your own wedding. While you’re at it, you also shouldn’t stick to the most obvious sources. Let go of your reins and look at everything from floral arrangements to wallpaper patterns. All of these are great sources of inspiration. You can make things even more exciting by having a board where you pin your inspirations. It will help you keep everything organized and also make it easy for you to see how different elements might fit together and find some common threads. The next step is to figure out just how formal you want your wedding to be. It could be a sit-down dinner where everyone is dressed formally. It could be a beach wedding where the style is laid back. It could be a ballroom wedding or a park wedding. Whatever the style you looking for, the dress code will help to achieve it. Your guiding light in this case should be what you prefer as a couple. If you like hosting wild parties, then your wedding should reflect some of this. If you’re more of the formal cocktail couple, then your guests should feel the vibe at the wedding. However it ends up, it should be fun! One thing you’ll quickly notice is that as your vision gets more detailed, it also gets more specific. If you like drag racing, then zoom in on that and model the wedding after the concept. Don’t leave it at modern wedding. Try to figure if you want a particular modern trend to emulate. It’s really all about getting more and more descriptive about the specifics. If you do it just right, it will be plenty of fun. One thing you should remember is not to try to do too much at once. You and your spouse might have different tastes. While you might be all about a Disney-themed wedding, your spouse might want something more masculine, like NASCAR. You will have to settle on one because if you try to mix things that shouldn’t mix, you’ll end up with a very dissonant wedding. Once you’ve decided upon a theme for the wedding, you should try to get it everywhere. In this case, a motif might help. This is a sort of pattern or insignia that you put in the invitation cards, the cups, etc. It should capture the spirit of the wedding in earnest. If you want a chic fashion themed wedding, your motif could be a stylized drawing of a model. Just don’t put it in too many places so it doesn’t look overdone. 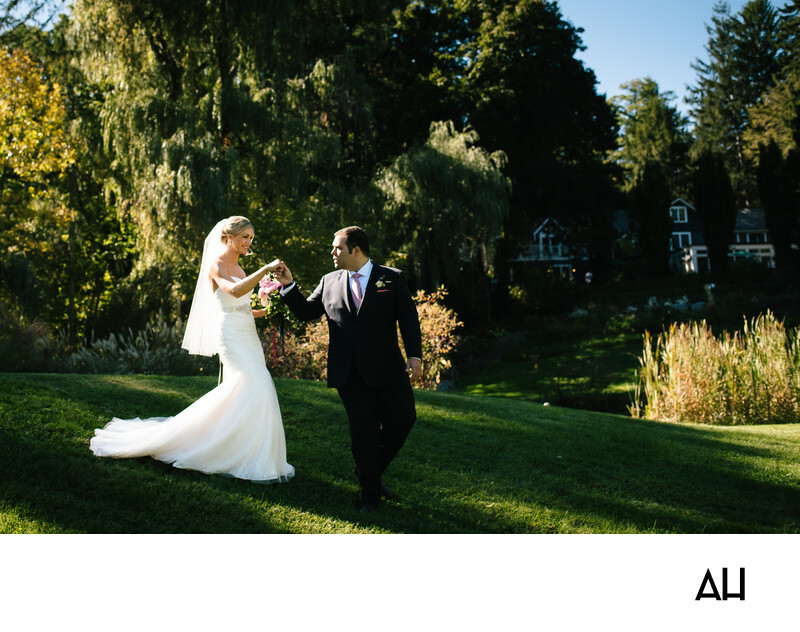 Buttermilk Falls Inn and Spa is an ideal location for Hudson Valley Wedding Photography. A wedding at Buttermilk Falls has a fairytale like quality to it. The venue includes a main house, multiple carriage houses and cottages, a luxury spa, and a variety of spaces for a dream wedding ceremony or reception. Set on a picturesque section of the Hudson River, Buttermilk Falls Inn and Spa produces exceptional Hudson Valley Wedding Photography. This image from a Buttermilk Falls wedding shows the bride and groom walking about the lush, green ground of the inn’s property. In the background of the photo, the main house peeks through the trees that shade it. The main house of the inn offers 18 guest rooms, including the Grand Laurel wedding suite for newlyweds to stay in on their wedding night. These newlyweds can’t seem to take their eyes off one another. The bride is stunning in her flowing white gown, as the groom leads her carefully down a small hill. The groom gazes at his bride, making sure that she is able to make it over the lawn in her heels and gown. She smiles radiantly at her new husband and she lets out a good-natured laugh at the endearing look of concern on his face. The pair glow under the natural light of the sun, and the trees leaves seem to sparkle around them as they walk. The moment is both enchanting and sweet, with the couple looking like royalty touring the grounds of their estate.